Every day of my trip I have reported chronologically, but my second day in Sonoma had an unexpected stop that had a huge impact on me. It wasn’t a phenomenal wine, I actually didn’t drink anything there. It was a blast into my past, if you pardon the war pun. Before I became a travel writer, a wine and spirits writer or even a tennis writer, entertainment was my niche. 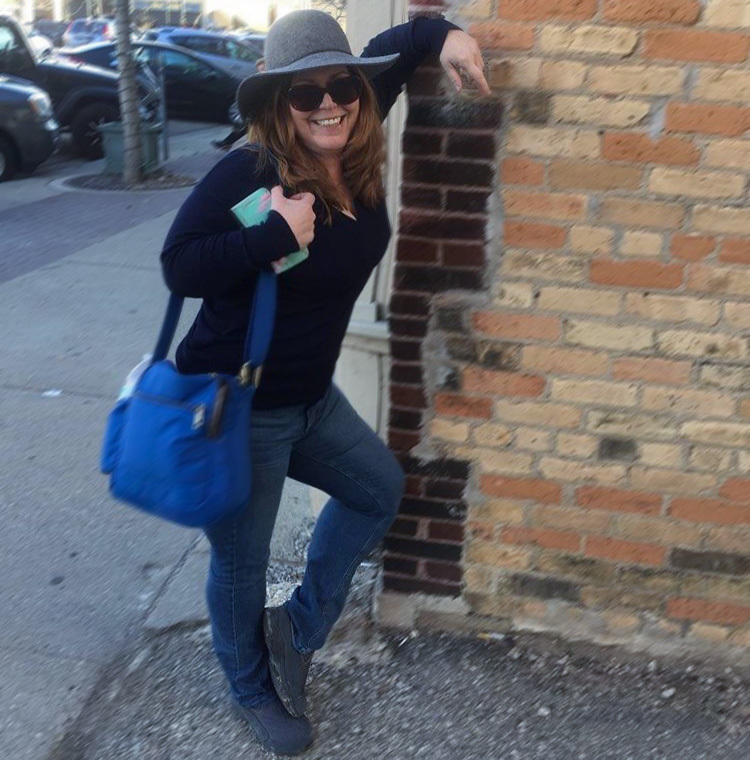 I wrote about music, theater and movies while I was in college and barely old enough to see an “R” rated flick. I took on the role of critic and that was in fact the title of my thesis. I had a few heroes and one came after a cinema class that took me to review “Apocalypse Now. 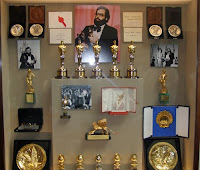 ” Francis Ford Coppola was (is) a genius to me. While I didn’t want to necessarily be a director, I did dream of becoming a screenwriter and collecting an Oscar. Finally getting to see one up close was the highlight of my day during my visit to the beautiful, but still under construction, Coppola Winery in Sonoma. 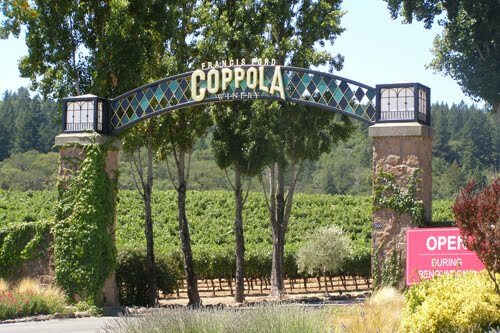 I must preface this self-indulgence with the fact that I have recexntly—though not on this visit with James through the grounds and memorabilia—tasted the Coppola wines. 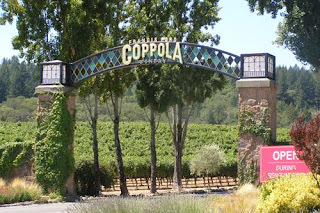 Director’s Cut is one of my favorites and winemaking is something Coppola takes very seriously. While you may not have quite the reaction I did, I recommend planning a visit to the winery to see (and sample) the magnificence of it. The day had begun when Beth of Wine Road picked me up the Geyersville Inn and we went to Costeaux French Bakery, an 87 year old bakery in Healdsburg that offers some of the best croissants outside of Paris. 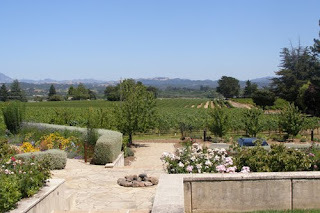 From there it was off to the Alexander Valley, where we visited Field Stone Winery. The entire tasting room building here is made from stones from the ground and it is beautiful. Wally Johnson made me immediately at home with the bottles representing colleges, which are hand painted. We had a bit of Cowgirl Creamery’s Bandage Wrapped Cheddar as we tasted from their varied collection of Staten Family Reserve Viognier, full of citrus; Russian River Gewürztraminer, light with apricot and peach notes; Vineyard Select Alexander Valley Merlot, a powerful wine full of flavor; the smoky Staten Family Reserve Alexander Valley Cabernet Sauvignon; and finally, a delicious Field Stone Staten Family Reserve Vintage Alexander Port, made from Petite Syrah. Just down the road from Field Stone is Medlock Ames, a fairly new winery that is most unusual. Chris Medlock James and Ames Morrison met at Tulane University and ended up here in the Alexander Valley of Sonoma making wine. They are self-sustaining and organic, offering an outdoor restaurant area with a Pizza oven, and a speakeasy –like bar (below) that opens when the tasting room closes, where you can get drinks like the “Miss Piggy,” with homemade bacon bourbon, organic maple syrup, Angostura bitters and fresh orange. 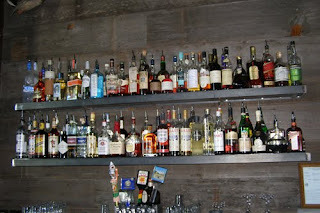 The most popular wine – especially during summer – at Medlock Ames is the Rose. It is drier than most and runs out quickly. Their Sauvignon Blanc radiates fruit the minute you open the bottle, and the Medlock Ames Cabernet Sauvignon is very good, but my favorite was the Reserve Chardonnay. This cherry-filled creamy blend is a mix of grapes from the Alexander and Russian Valleys. After Coppola’s, C. Donatiello was the next stop in Sonoma. This scenic winery (below)—which offers an outside music series through the fall -- just began doing wine and cheese pairing so we got to sample the unusual local Artisan cheese along with the wine. The selection from Bellwether Farms Creamery was tasty, as was the wine. The 809 Clone Chardonnay was only oaked for four months so it retained a lighter flavor than the 10 month aged Orsi Chardonnay, a totally different wine with a strong pepper flare. The Floodgate Block 15 Pinot Noir had a sweet nose and was a rich wine, but my favorite was the 2007 Russian River Valley Pinot Noir, which is a blend of several vineyards. The final winery of the day was the most sustainable. 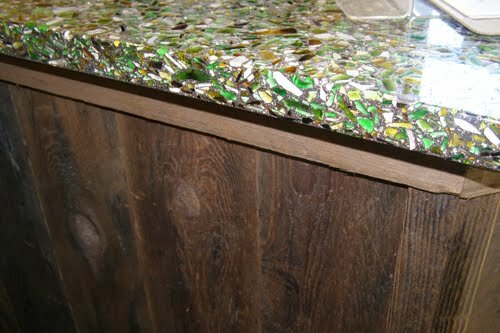 In fact, even their bar (below) was built from recycled bottles! Inman Family Wines in Santa Rosa, part of the Russian River Valley, started me with something I enjoy and have not seen since arriving in California – Pinot Gris. Their Russian River Valley Pinot Gris was quite a gamble, but this drier version of the Italian wine has worked well for them. Another popular wine is the Inman Family Endless Crush Rose. This Pinot Noir Rose was a bit dry for my taste, but Beth absolutely loved it. Pinot Noir is the specialty at Inman Family and we had three. My favorites were the RRV Pinot Noir, still full of berries after only a short time in oak, and the OGV Olivet Grange Vineyard Estate Pinot Noir, very rustic with a long pepper finish. For those who really want a more earthy wine, I’d suggest the Thorn Pinot Noir. After Inman Family, I was off to a new type of adventure as I headed to Marin County. 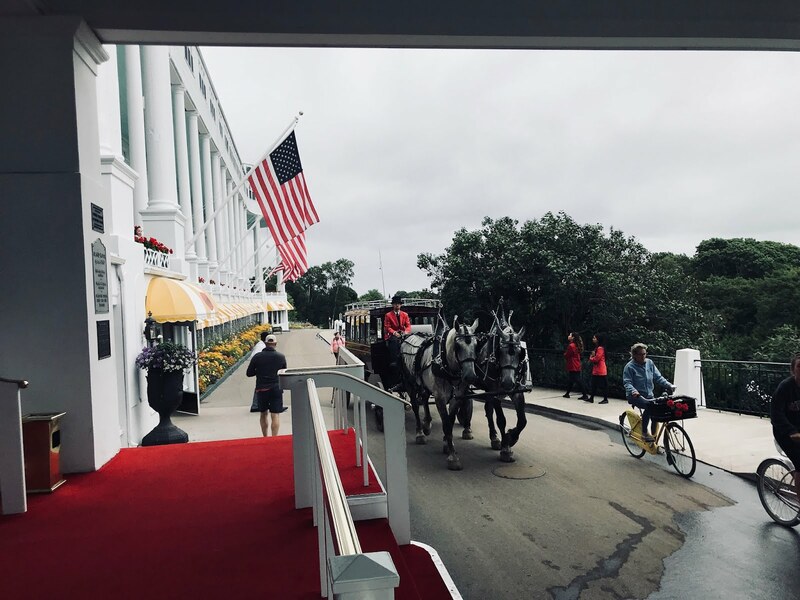 I checked into the stunning Gerstle Park Inn (more to come on this place), where I have two days to unpack a bit and explore. I learned a bit more about the area over a scrumptious dinner with live music at the Panama Hotel Restaurant – Pa Pappardelle Pasta is a perfect vegetarian dish – with Christine Bohlke of the Marin County Convention and Visitors Bureau and rested up for a trip to Iron Springs Pub & Brewery and a Girls Getaway with my nieces.